A meat grinder can be a useful kitchen appliance to have on hand, especially if you work with a lot of raw meats, sausages, and specialty foods. 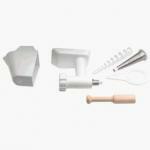 Both hand-cranked and electric models are designed to handle a wide variety of ingredients. Depending on the model, you can use meat grinders to make bread crumbs, process homemade baby food, grind your own hamburger meat, mince foods for recipes, and create sausage links. One of the main benefits of DIY grinding is that everything that goes through the grinder is under your control — effectively eliminating the worry about preservatives, additives, or cross-contamination. There are a lot of different kinds of meat grinders out there. Some are electric and advertise a lot of extra functions available to the home chef. Some are hand-held manual cranks, employing traditional methods that date back to the 19th century. 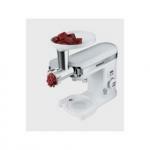 You’ll also come across meat grinder attachments for stand mixers as well. The benefit of using a manual meat grinder (versus electric) is that it’s usually smaller in size, too, which makes it ideal for countertop storage. This also means that it’s best used for smaller quantities of meat. Electric meat grinders are better suited for larger jobs and repeated use, since using a hand crank for large jobs can be exhausting. They often come with different sets of interchangeable plates for making pasta, sausage, and baby food, for example. Look for a grinder that has a “reverse” function. If the meat gets clogged inside, reversing the motor will help loosen things up. 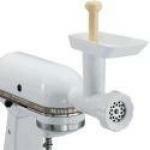 Kitchen stand mixers often have meat grinder attachments that you can purchase separately. If you own a stand mixer, the advantage to using an attachment is that foods can be evenly pre-mixed with spices and sauces before going into the grinder attachment, like garlic hamburger or Italian sausage meat. Without a mixer, the foods are usually mixed afterwards. Mixing beforehand allows for a better-looking food product after the grinding is complete. You’ll see popular kitchen brand names like Waring, NorPro, Panasonic, and KitchenAid during your meat grinder search, as well as Hobart, Tor-Rey, and Biro. Most kitchen appliance companies have their own meat grinder on the market. 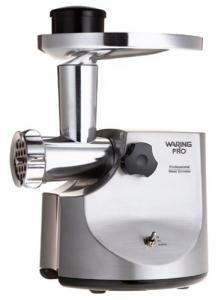 Just keep in mind what you want to use your meat grinder for and how often you’ll want to use it. This will help you narrow down your options on size, special functions, and horsepower. To start your search, check out the Waring Pro Professional, a machine ideal for smaller jobs and compact kitchen storage. Although considered adequate for a home kitchen, if you intend to use the Panasonic MK-G20NR-W Meat Grinder on a regular basis you'll need to consider the limits of the machine. Some of the construction is lightweight and the motor is a little underpowered for the task.